We've been waiting far too long to have this incredible singer-songwriter join us for a night at The Haviland! 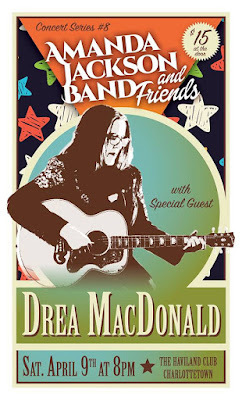 A singer-songwriter based in Canada's smallest province, Drea MacDonald is a crafter of pop/folk songs with a confessional slant. She'll make you tap your toes and test your heartstrings at the same time. Her newest album "Lucky" was just released in November of 2015 and is a return to the folk/rock sound of her early recordings. If you can't wait until the show to grab a physical copy of the recording, you can preview it and grab it on iTunes today. For those of you unfamiliar with the format of these shows, Drea will start the night out with her set and we will join her on a couple of songs of her choice. After a break, we'll hit the stage with a full set and then Drea will join us for a couple of our song choices! P.S. Reggie will be back from his travels so be sure to come out and give him a hug! Admission is $15.00 at the door and we will begin accepting payments no later than 7:30pm. You will be provided a number for seating order but there are no assigned seats (first come-first serve). Please feel free to come earlier to enjoy a drink and social time! Doors will be open for seating by 7:45pm with show starting at 8:00pm!